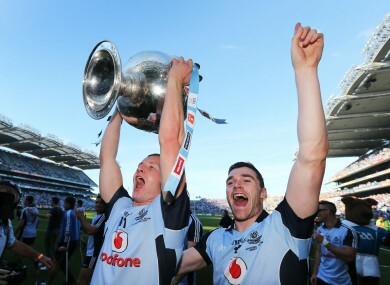 Ciaran Kilkenny and Paddy Andrews celebrate with the Sam Maguire cup after Dublin beat Mayo in the All-Ireland final. ALAN BROGAN BELIEVES the emergence of young stars such as Ciarán Kilkenny and Jack McCaffrey have the county in a strong position for further tilts at the Sam Maguire. The three-time All Star will make a call on his future with Dublin early in the New Year after an injury-hit 2013. While Brogan missed out on the on-field action, he trained regularly with the team and sought to offer advice to the next generation of talented Dublin footballers. While Brogan revealed his own inter-county future is not yet certain, he has no doubt that his brother, Bernard will continue to prosper alongside Dublin’s young guns. He said, “People expect so much from Bernard now. I think he was scoring six, seven points in matches and people were still saying he wasn’t playing well. Look, after 2010 he was our marquee forward and was always going to be a marked man, which would obviously make things difficult for him. Brogan added, “Sometimes fellas have bad games and we can’t be expecting Bernard to be shooting the lights out in every game. He just keeps going and keeps doing the right things. I know how talented he is. If he has a couple of bad games in a row, it’s very rarely that a third one comes. Email “‘Ciarán Kilkenny has all the attributes to be one of Dublin’s best’ – Alan Brogan”. Feedback on “‘Ciarán Kilkenny has all the attributes to be one of Dublin’s best’ – Alan Brogan”.